Most of the time, flaky, itchy scalp is caused by dry skin. If this is the case for you you’ll probably notice dry skin elsewhere on your body as well. The best way to treat such kind of dandruff is to rehydrate or moisturise the scalp. One effective remedy that I have tried on my family with success is: grapeseed oil and lime juice mixture. Grapeseed oil, which comes from the seeds of the grapes, is a wonderful moisturiser for the dry skin. Grapeseed oil is abundant in one particular type of fatty acid known as linoleic acids. The interesting bit about linoleic acid is that people who have itchy, scaly scalp or dermatitis have low levels of linoleic acids in their skin. What linoleic acid does is it forms a protective barrier –so basically it traps in the water and prevent it from evaporating from our skin, and therefore keeping the skin moisturised and soft. Moreover, grapeseed oil contains special compounds called phytosterols which help to soothe the irritated scalp as well as reduce itching. A little bonus — these phytosterols can also soften your hair strands, so no more stiff and fly-away hair for you! 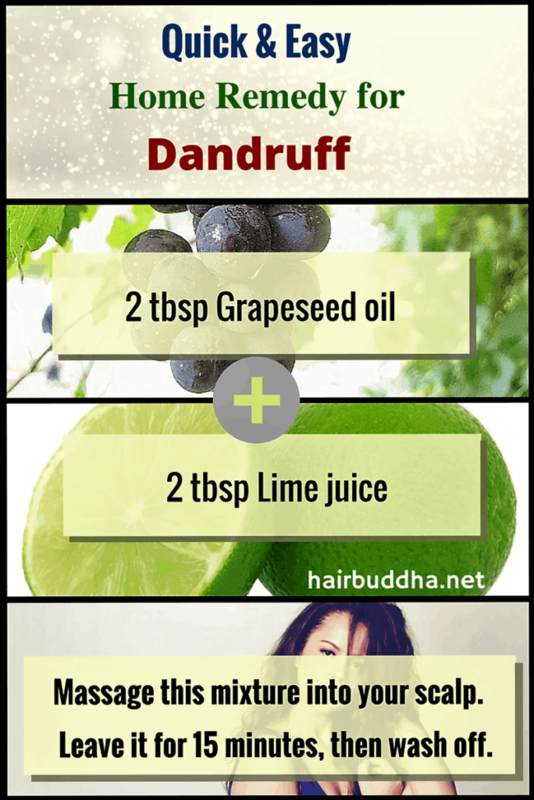 The lime juice (you can also try apple cider vinegar) works to cleanse your scalp and rid it of any loose, dry flakes of skin. Stir both the ingredients together until mixed well. *You can also try apple cider vinegar instead of lime juice. Repeat this remedy every week. Enjoy your dandruff free scalp and soft, shiny hair. Don’t wash your hair with hot water; it will make your scalp more dry. Use lukewarm or cool water. Also, don’t wash your hair too much (for the same reason as above). Aim for every two or three days. Apply oil before washing. This will protect your scalp and prevent your skin from drying out. Dry, flaky skin anywhere on your body is often a sign of a deficiency in essential fatty acids. Include pumpkin seeds, sunflower seeds, flax seeds, almonds, cashews and walnuts in your diet. You can also take omega -3 supplements to keep your cells strong and full of moisture. Use natural shampoo. Ingredients such as SLS, artificial fragrance, and colours can irritate your scalp, leading to dandruff. Have you tried this home remedy before? Will do a post on it soon. Enjoy your travel! I have had good success with coconut oil and lemon juice.